So confident are Liverpool’s starting front-three at the moment, they’re practising their celebrations before games! “It’s something we have practised for fun sometimes before the games.” he told the official website. 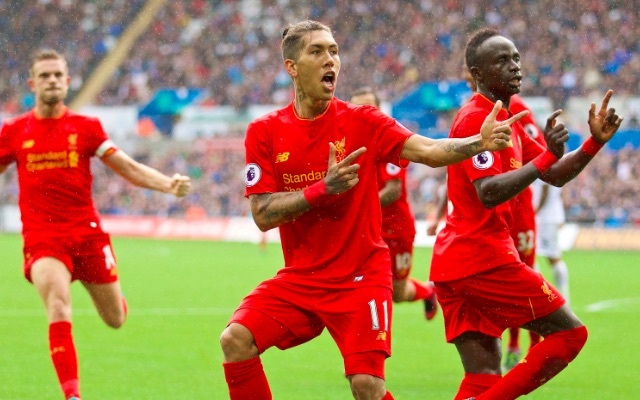 “Against West Brom, it was a new Brazilian dance and Coutinho and Firmino tried to teach me it. I think I know now how to dance it and I love it! We enjoyed doing it after the goal. “The main teacher was Firmino – he taught me all the moves and everything. “I hope next time it is my [celebration] because I am also trying to teach them a celebration, and after I score next time, they are going to dance it. With any luck, that’ll be today against Crystal Palace at Selhurst Park. Mane will begin the game on the right, Coutinho on the left and Firmino central – with Daniel Sturridge and Divock Origi providing top backup from the bench. In fact, it’s difficult to remember a time when Liverpool had such firepower, in truth. We’ve only kept one clean-sheet in the Premier League this campaign though, so it’ll be our ability to deal with Palace’s aerial threat, as well as our offence hitting form, that defines our chances of victory. As for Mane’s Senegalese dance, we’re excited to see it! Providing he’s finding the back of the net (he has four so far this season) he can celebrate however he likes!